The Canada Water landmark aluminium clad public library, shaped like an inverted pyramid, was designed to house 40,000 books and 2,500 DVDs. FG Library Products worked with the architect on the £14 million library project in Canada Water, London, to supply shelving and furniture solutions based on the architects vision to merge modern and traditional themes in a functional space, while complementing the features of the building which centred around curves. FG designed and supplied bespoke oak clad, curved metal Reflection shelving with integral lighting and angled corner displays, offering a dynamic curved solution that enhances the striking interior. Bespoke furniture items included an oak veneer reception uniquely branded. 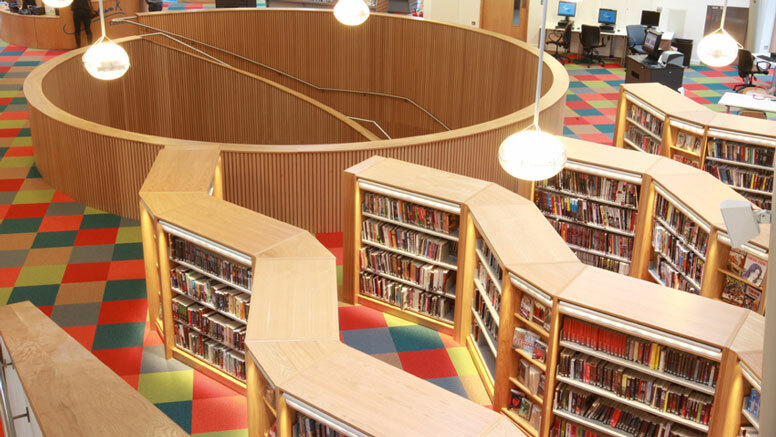 The audio visual display units were designed to complement the curved theme and maximised the display potential of the extensive DVD collection. The children's area featured a 'kinder boat' in keeping with the Canada Water theme.